Beggars All: Reformation And Apologetics: Luther"s Antisemitism: "We are at fault in not slaying them!" 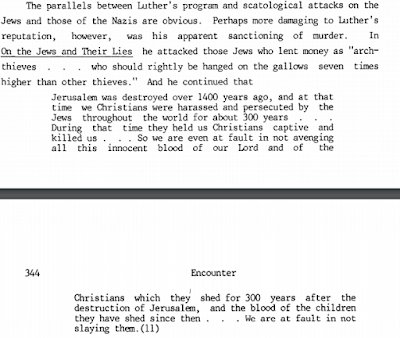 Luther"s Antisemitism: "We are at fault in not slaying them!" There is no other explanation for this than the one cited earlier from Moses - namely, that God has struck [the Jews] with 'madness and blindness and confusion of mind' [Deuteronomy 28:28]. So we are even at fault in not avenging all this innocent blood of our Lord and of the Christians which they shed for three hundred years after the destruction of Jerusalem, and the blood of the children they have shed since then (which still shines forth from their eyes and their skin). We are at fault in not slaying them. Notice "We are at fault in not slaying them" is quoted twice in this excerpt. In the first occurrence, Wikipedia states Luther "seems" to advocate murdering the Jews. In the second occurrence, Wikipedia prefaces the quote stating, "Martin Luther advocated that Jews be slain." The first occurrence dates back to the original 2008 Wikipedia entry where the quote appears at the beginning of their synopsis, stating, "He also seemed to sanction their murder, writing 'We are at fault in not slaying them.'" Over time the article was expanded. This comment and quote changed to, "He also seems to advocate their murder, writing '[w]e are at fault in not slaying them.'" This was later moved into a new subsection covering Luther's book, On The Jews and Their Lies. The second occurrence was added in September 2016 in the same subsection. It appears someone was attempting to provide "the full context" of the quote "in which Martin Luther advocated that Jews be slain." There were too many hands in the Wikipedia cookie jar: note the incoherence which happens when multiple people edit an entry. Did Luther "seem" to sanction exterminating Jewish people or did he actually actively "advocate" the Jews be slain? Whoever added the alleged "full context" does not appear to have proofed the entry for internal consistency. While Luther's comment is atrocious and can be classified as antisemitic, I will argue this comment, placed in context, is not actively advocating the murder of Jews. Lest there be any misunderstanding: I am not arguing that Luther's comment, "we are at fault in not slaying them" is not blatantly antisemitic or that Luther should be excused for the comment. Rather, what I think is happening with the quote is that it's being used to make Luther worse than he was: yes, he's guilty of harsh rhetoric against the Jews, yes he's guilty of advocating societal cruelty on the Jews, but he is not guilty of calling for their extermination in this quote. For his Luther quotes, Michael provides a footnote referring to LW 47, 242, 265, 167. Page 242 refers to "archthieves. . . who should rightly be hanged on the gallows seven times higher than other thieves." Page 265 refers to the bulk of the quote provided, save the last line, "We are at fault for not slaying them," which is supposed to be on page 167; Michael though made error, the quote is found on page 267. The second reference provided by Wikipedia is "Luther, Martin. On the Jews and Their Lies, translated by Martin H. Bertram, in Luther's Works (Philadelphia: Fortress Press, 1971), 47:267." The reference is accurate. There are two minor additions to the quote as presented by Wikipedia: "them" has been replaced with [the Jews], and the reference, "[Deuteronomy 28:28]" is not found on page 267 at this location in this English text. In addition, no one is holding them here now. The country and the roads are open for them to proceed to their land whenever they wish. If they did so, we would be glad to present gifts to them on the occasion; it would be good riddance. For they are a heavy burden, a plague, a pestilence, a sheer misfortune for our country. Proof for this is found in the fact that they have often been expelled forcibly from a country, far from being held captive in it. Thus they were banished from France (which they call Tsorfath, from Obadiah), which was an especially fine nest. Very recently they were banished by our dear Emperor Charles from Spain, the very best nest of all (which they called Sefarad, also on the basis of Obadiah). This year they were expelled from the entire Bohemian crownland, where they had one of the best nests, in Prague. Likewise, during my lifetime they have been driven from Regensburg, Magdeburg, and other places. If you cannot tolerate a person in a country or home, does that constitute holding him in captivity? In fact, they hold us Christians captive in our own country. They let us work in the sweat of our brow to earn money and property while they sit behind the stove, idle away the time, fart, and roast pears. They stuff themselves, guzzle, and live in luxury and ease from our hard-earned goods. With their accursed usury they hold us and our property captive. Moreover, they mock and deride us because we work and let them play the role of lazy squires at our expense and in our land. Thus they are our masters and we are their servants, with our property, our sweat, and our labor. And by way of reward and thanks they curse our Lord and us! Should the devil not laugh and dance if he can enjoy such a fine paradise at the expense of us Christians? He devours what is ours through his saints, the Jews, and repays us by insulting us, in addition to mocking and cursing both God and man. They could not have enjoyed such good times in Jerusalem under David and Solomon with their own possessions as they now do with ours, which they daily steal and rob. And yet they wail that we have taken them captive. Indeed, we have captured them and hold them in captivity just as I hold captive my gallstone, my bloody tumor, and all the other ailments and misfortunes which I have to nurse and take care of with money and goods and all that I have. Alas, I wish that they were in Jerusalem with the Jews and whomever else they would like to have there. Since it has now been established that we do not hold them captive, how does it happen that we deserve the enmity of such noble and great saints? We do not call their women whores as they do Mary, Jesus’ mother. We do not call them children of whores as they do our Lord Jesus. We do not say that they were conceived at the time of cleansing and were thus born as idiots, as they say of our Lord. We do not say that their women are haria, as they do with regard to our dear Mary. We do not curse them but wish them well, physically and spiritually. We lodge them, we let them eat and drink with us. We do not kidnap their children and pierce them through; we do not poison their wells; we do not thirst for their blood. How, then, do we incur such terrible anger, envy, and hatred on the part of such great and holy children of God? Luther in context is bombastically arguing against the oppression of the Jews, saying rather that the Jews are oppressing the Germans! He presents the ludicrous argument that it is they that are benefiting off German land, at the expense of the Germans. He further takes as true the the rumors that the Jews were killing German children and poisoning wells. 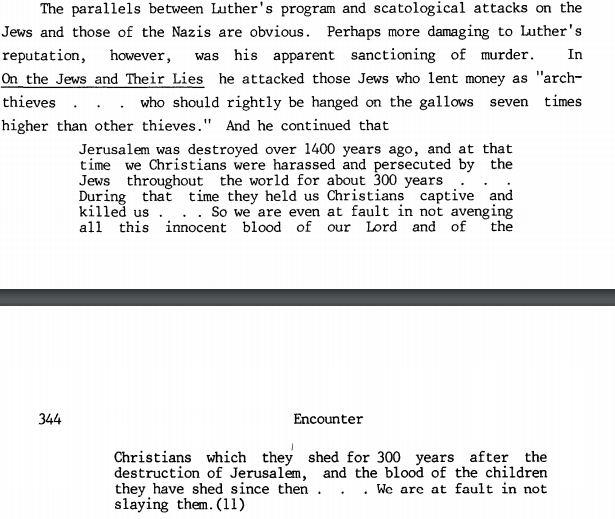 "We are at fault in not slaying them" is part of a ridiculous rhetorical argument in which Luther accepts the negative Jewish stereotypes of his day, then he attempts to present the case that despite these Jewish crimes, the Germans were gracious and kind to the Jews. The argument is absurd. Recall Wikipedia claimed to be giving, "the full context. "Notice that the quote continues after the point where Wikipedia stops. Luther is not saying that the Germans should go out and kill the Jews. He's saying that if all the negative things are true about the Jews are true (as he previously stated, like killing children, poisoning wells, etc. ), the Germans were at moral fault for allowing them to live. Rather, Germany has allowed them "to live freely in our midst despite all their murdering, cursing, blaspheming, lying, and defaming; we protect and shield their synagogues, houses, life, and property. In this way we make them lazy and secure and encourage them to fleece us boldly of our money and goods, as well as to mock and deride us, with a view to finally overcoming us, killing us all for such a great sin, and robbing us of all our property..." This is a rhetorical descriptive argument. It is not a prescription to go out and kill Jews. While Luther may be acquitted here from advocating murder, he is not vindicated for his antisemitism by the context of The Jews and Their Lies. He did make sinful comments against the Jews, some of which did advocate violence and oppression. For instance, he was so against Judaism by this point that he advocated that "they be forbidden on pain of death to praise God, to give thanks, to pray, and to teach publicly among us and in our country" (LW 47:286). Some scholars have argued there were theological reasons why he made such harsh comments against the Jews, but I've found none of them to be so compelling as to exonerate him from the charge of antisemitism. Advocating cruelty to human beings, particularly basing it on unfounded rumors, is truly a dark spot on Luther's career. On the other hand, making Luther worse than he was by saying in the quote explored above that he wanted the Jews slain... this is presenting a contextual error. What the quote shows in its "full context" is that Luther presented an argument based on accepting unsubstantiated and slanderous rumors about the Jews. In order to put Luther’s On the Jews and Their Lies in some immediate religious context, it is helpful to see what other Christian figures were saying about Jews just prior to 1543. In 1529, Andreas Osiander authored a tract, published anonymously in 1540, that systematically and forcefully refuted the charge of Jewish ritual murder of Christian children. Osiander was a Christian Hebraist who engaged in the study of Cabbala and had a thorough knowledge of rabbinic literature and the Talmud. He argued that it is “inconceivable that the Jews should murder children and make use of their blood” when their own Kosher laws forbade them even to eat the meat of animals containing blood. The treatise appeared just as the investigation of one such supposed murder at Tittingen was ongoing. Enraged by Osiander’s defense of the Jewish community and called upon by the Bishop of Eichstätt to rebut it, Johannes Eck, Catholic theologian and Luther’s nemesis, wrote what amounts to a lengthy retort to Osiander and a denigration of Judaism. It has been described as “a compendium of every horror story medieval anti-Jewish polemic could encompass.” In Refutation of a Jew-Book, Eck based his passionate argument of the historical reality of Jewish ritual murder on his own personal experience. According to Eck, he had actually “placed his own fingers in the wound of a child who had died four weeks before at the hand of the Jews of Waldkirch in the Breisgau in 1503.” The book also includes a call for “new and more stringent laws” against Jews and strong condemnation of usury. Thanks so much for the info. I don't recall ever going over Osiander's book, but I'd have to check my archives. On the other hand, I'm aware of Eck's work against the Jews. It all comes down to how one defines antisemitism, and I was persuaded by Gritsch to define the word in a modern sense. However, this does not mean I now buy all the charges against Luther. While I may come down harder now Luther on this topic, this doesn't mean I'm now arguing Luther was Hitler's spiritual ancestor (Peter Wiener). Given current trends in left-wing censorship, I attempted to be as careful as possible in this post to say I think Luther's attitude towards the Jews was wrong, and not to be condoned, in any way. 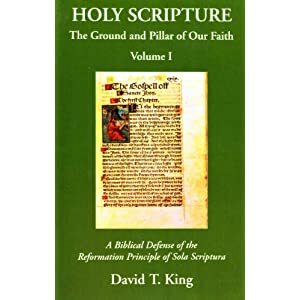 Glad if Osiander's work is helpful, and indeed it is duplicitous for RCs to rail on Luther for his words against the Jews in te light of how the church they seek to defend dealt with Jews. Regarding which I have posted a compilation . And thanks for the two links, regardless of what left-wing censorship demands. What led me to Osiander's work was seeking to find out how credible the charges were against the Jews. I have a special affection for the Jews, and Israel (not because I think this will hasten the "rapture" - which is actually the 1st resurrection the way i see it ), but while not affirming all Luther said, much less his attitude and recommendations, to say the least i do not think they were characteristically easily lovable (neither did Moses or Paul! ), being known for altruism and running Salvation Army programs, but may have been rather characteristically stubborn and difficult an insular people overall who earned a negative social reputation. Which does not excuse the whole negative attitude of Rome or Luther toward them. The link is to a "404" error. "Whoever added the alleged "full context" does not appear to have proofed the entry for internal consistency." That is not what wikis are built for. Take them as encyclopedian polyphony. Very probably, if you compare versions, someone would have stated "advocated" and someone else amended to "seems to advocate". This particular blog entry of mine was provoked by an online discussion with someone relying on Wikipedia for the Luther quote in question. A person kept posting the quote over and over, and kept saying, Wikipedia provides the full-context. I'm not advocating completely avoiding Wikipedia, only that one should use caution.